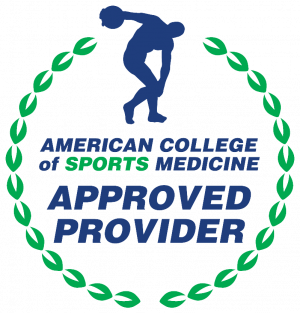 Fitness Mentors is pleased to announce we are now recognized by the American College on Sports Medicine (ACSM) as a Continuing Education Provider. ACSM certified personal trainers are required to obtain 45 CECs every three years to maintain their certification. The purpose of this recertification is to maintain a specific level of competence as a health and fitness professional. There are three ways to recertify: online, by fax or mail. Fax: fill out renewal form, fax to number on page. Mail: fill out renewal form, mail to address on page. How often do I need to get ACSM CEUs to recertify my CPT? ACSM CPT professionals are required to recertify their continuing education requirements every three years. How many ACSM CEUs do I need to recertify? To satisfy the minimum ACSM CEU requirement you must earn 45 CECs every three years. Are there additional ACSM-CPT recertification requirements? ACSM professionals also need to maintain their current CPR certifications. What providers can provide ACSM-certified CEUs? Only ACSM approved providers can provide reputable continuing education to ACSM certified professionals.